As the month of January begins, we once again hear the final story in the nativity narrative as on Sunday 7 January we celebrate the Feast of the Epiphany. It's that well-known story of the visitors from afar who come to visit the infant Jesus and to bring him gifts of gold and frankincense and myrrh. The Book of Common Prayer subtitles the Epiphany as 'The manifestation of Christ to the Gentiles', which serves to remind us and to emphasize that from the moment of the incarnation, the message of the Christian gospel is for all people -- Jews and Gentiles, rich and poor, wise and not so wise -- everyone is included in the new world order that came into being with the birth of Jesus. We don't know if there were three of them. We don't know if they were all male. We don't know if they arrived when Jesus was a tiny baby or whether he was already a toddler by the time these folkd arrived with their extravagant gifts. 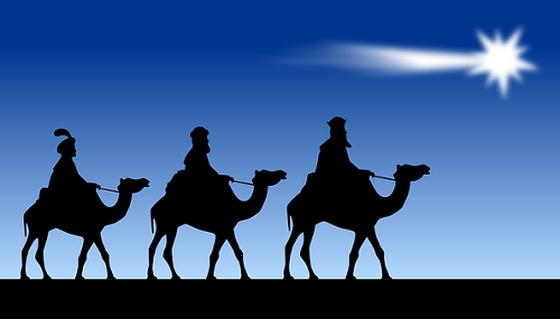 We don't know what their profession was -- were they Magi or astrologers? The notion that they were kings is a much later and also non-scriptural tradition and so, like the rest of the nativity stories, the story of the Epiphany is a somewhat jumbled-up mixture of myth and reality. In the midst of a wonderful story of long-distance travel, unsettling proclamations and amazing gifts, there is at the centre the reality of the Christian message -- all are welcome at the birth-place of the Christ-child. While the secular world tends to pack Christmas away and move on to the next thing very quickly in our society, the Feast of the Epiphany can serve for Christians as a meditation. We hear the last chapters of the story, we ponder the message that the story's end presents to us, and we prepare ourselves to move forward and to hear once again through the coming year, the story of Christian faith and Christian life.